Shure has produced truly premium headphones that make monitoring an easy pleasure. Exceptional clarity and detail. Light and comfortable to wear. Impressive low end extension. Price. Low mids sometimes dominated by the bass. Having grown to love and rely on our old 'pro' headphones for years, unzipping the carry case for these new Shure SRH1540s felt a little unfaithful. Knowing that they're more than twice the price of my ol' faithfuls was a cause for pause before putting them on, but we had a job to do. "They're very light, which makes them very easy to wear for extended periods"
The SRH1540 headphones are very light, though the carbon and (aircraft grade) aluminium alloy yoke and frame are remarkably strong, and this makes them very easy to wear for extended periods. The ear pads are firm, sitting comfortably over the ear with very little pressure. The package includes a pair of replacement pads for when the inevitable hair grease and head sweat onslaught overpowers the super-modern materials employed by Shure. Our ol' faithfuls' earpads now seem flaccid and threadbare in comparison. The zippered carry case also includes two sets of cables. These are 'dual-exit', meaning they feed the two drivers separately with the cable split well below the chin. This writer has only had the 'cable-to-one-side' system for studio headphones and so struggled a little when taking the 1540s off, either catching them under the chin or pulling glasses off etc. As the headphones are so light this is probably the best approach for keeping the weighting balanced. The plug ends are a snap-in format we've not come across before (MMCX, gold-plated of course) that seem to stay in place until the tugging gets excessive, so they are unlikely to jerk your neck too much if the cable gets caught up when you move around. Though these are a closed-back design (the driver and ears are isolated from external sound) they are not the most isolated we've come across, an unavoidable trade-off for lightness. But as these are listening headphones (as opposed to performance monitors) it's not a big issue. "The sound quality is superb and makes our 'pro' pair sound a bit sludgy and veiled"
The bottom end of the 1540s' frequency range is 5Hz, and despite being two octaves below our nominal hearing limit it certainly feels so; it's like wearing a sub on your head. 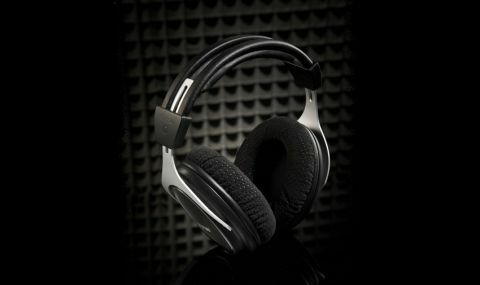 The sound quality is superb and makes our 'pro' pair sound a bit sludgy and veiled. In fact when we took the 1540s off with the monitors running we noticed a lot less difference than we're used to. The high end is crystal clear and the transient detail is immaculate across the board - kick drum punches aren't pulled, reverb tails can be picked out in a dense mix, close vocals fill your head and, most importantly, the slightest distortions are instantly noticeable. It may seem odd to talk about stereo imaging when the two speaker drivers are separated by your head, but the clarity does make for a glorious stereo picture. The sound staging is as deep and wide as the source, making subtle mix placement easy. The flipside is that poor tracking and mixing don't get flattered. The crystal clarity almost feels artificial, though we don't mean this negatively. Our only criticism is that the low mids feel a bit dominated by the deep bass extension and clarity - a masking effect due to our own auditory expectations and preferences. The term 'premium' implies quality over economy to deliver the best possible product, and by this definition Shure are right to classify the 1540s as such. The price tag is also premium, putting them out of budget for many, but professionals who rely on high quality headphones would definitely not regret this investment. It is often the case that you can't imagine better sound quality until you hear it, and the 1540s opened our ears to the possibilities.